The Restart Project is a London-based social start-up bringing the spirit of ‘make do and mend’ to our use of gadgets in order to prevent needless waste. Tech waste is one of the fastest growing waste streams worldwide, including the UK. 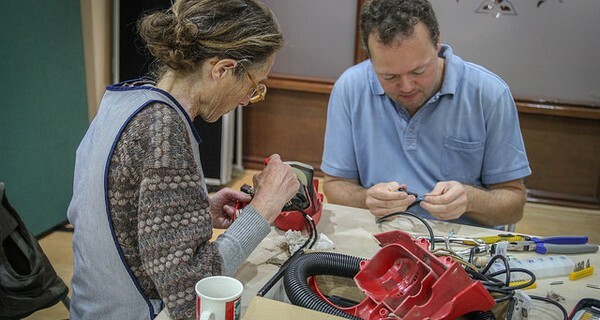 Restart Project runs free community repair and maintenance workshops, called Restart Parties, to help people extend the lifespan of their gizmos. It was founded by two activists returning to the UK from the developing world, who were shocked at the casual way we discard our electronics as soon as it breaks or at the launch of a newer model. The group has worked alongside Transition Towns and Freecycle: with events happening everywhere from Florida to northern Italy. Parties are run by volunteer repairers, or ‘restarters’. People arrive with their electronics (cameras, car radios, laptops), describe the symptoms of the fault, after which the restarters discuss options before, taking the damaged device apart on the spot, and showing you how to fix it — all for free. Some are fixed in seconds, and overall there’s a 50% success rate. "Things that end up in a skip could have a second or third life if only we use some basic repair skills. They fix almost everything in the developing world. They just don’t have the money to buy them new," say the founders. The group doesn’t just want to change how we behave as consumers, it wants to change company policy too: they point out that Apple sold nine million new iPhone 5s over the first weekend alone but reckon there’s an untapped audience of those who would be more loyal to electronics companies that built their devices to last, and who are increasingly turned off corporations’ ‘planned obsolescence’. Restart Project aims to be self-sustaining through paid services, running events at employers, by end of 2014.